Bangs are an essential part of many hairstyles. If you don't want to commit to cutting your hair, clip in bangs are a great option to immediately achieve the look without cutting your hair. In addition to clip in bangs, we also offer hair bangs that attach inside of hats or scarves. These are ideal for cancer patients and women with hair loss who want the appearance of fringe framing the face but do not want to wear a full wig. No matter your reason for wearing hair bangs, we offer a wide variety of options! Let’s face it - entire reputations have been formed from strategically chopped facial fringe. Cleopatra’s blunt bangs brought down a nation. Farrah Fawcett’s crop defined a decade. Whether you’re hoping to rule a country or just try a new look for the day, our selection of clip-in bangs will allow you to reap the rewards without the risk. Who Are Fake Bangs Meant For? The bottom line is that clip-in bangs are worn by people who want...bangs. You don’t have to be experiencing hair loss to rock them, and you don’t need to be a fashionista to pull them off. True, many of our customers purchase bangs to help cover a thinning patch or to make their hair appear thicker. For people experiencing hair loss, clip-in bangs can be worn beneath headpieces like hats or scarves to frame the face and soften the appearance. However, lots of people wear clip-in bangs just because they want a fresh look. Fake bangs are a low-maintenance and accessible way to try a different vibe. Perhaps the most daunting part of clip-in bangs is figuring out how to attach them to your head. Rest assured - you won’t need a professional hairdresser to make it happen. The attachment method depends on what type of bangs you buy. True clip-in bangs are secured with discreet, pressure-sensitive clips that typically work best if you have some of your own natural hair to use as an anchor. However, if you’re working with a blank palette (read: no hair), our Ultimate Fringe Bangs are what we like to call “Add a Bang.” All you need is a head and a headpiece, like a hat or turban. The bangs come laid out on a long piece of velcro, so you can attach them directly to a headpiece (sewing works too). However, we strongly recommend checking out our patented - and beloved - Instant Hair Headband. Like the Spanx of the wig world, our Instant Hair Headband adds convenience and versatility to your styling choices without long term commitment. See for yourself. In our fake bangs shop, we’ve got two different cap types available - classic and monofilament. You’ll notice that monofilament wigs tend to be more expensive than classic wigs, and that’s due to the construction method. Monofilament wigs are more delicately made, and look highly natural. However, classic wigs are a good option for someone who values low maintenance, excellent quality at a budget-friendly price. 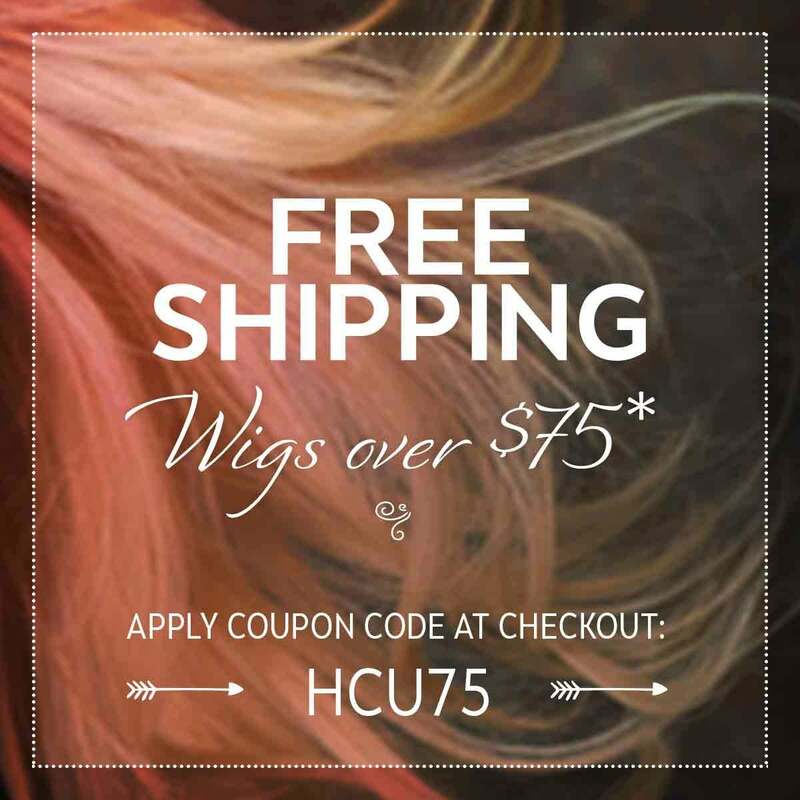 Our Types of Wigs guide can give you more insight into these options. The fun part about fake bangs is figuring out how to top them off. For an everyday look with a beautiful drape, we recommend our 100% cotton oversized head scarf (rest assured, we’ll send a guide for how to tie). If you’re more of a hat broad, our in-house designed Florette Newsboy Hat, made of luxurious, breathable bamboo, is a comfortable and stylish crowd pleaser. For a casual take on the classic beanie, our Brooklyn Beret Slouchy Cap is cool enough to take to the streets. Finally, check out our “little black dress” of head coverings - the Cotton Trinity Turban. This fantastic piece can be worn three different ways, dressed up or down, and paired with any outfit in a cinch.